Specialist carpet and floor covering retailer, Carpetright trades from over 400 stores and concessions in the UK and Ireland, as well as 89 stores in Holland and Belgium. The company imports large rolls of flooring material, mainly from mainland Europe, and has extensive warehousing capability in the UK where carpets and vinyls are stored and cut, to supply retail outlets and meet customer orders. During 2008 Carpetright carried out a consolidation of its storage sites with the amalgamation of its stock at a large warehouse in Purfleet, Essex. The building itself is about five years old, but Carpetright needed to carry out the necessary work to make it suitable for a major distribution depot. The company approached Nuform Fire UK Limited to install a high-tech fire-protection sprinkler system at the site, and it was decided that an off-site manufacture approach would have major benefits for this large distribution depot. Instead of having individual components delivered to the site in the traditional way and building the fire pumphouse at the warehouse, Nuform approached Armstrong – specialists in the off-site manufacture of fire and HVAC plant rooms. The diesel fire package, which is compliant with Factory Mutual standards, was assembled by Armstrong at its purpose-designed factory in Halesowen, West Midlands. After assembly and testing, Armstrong delivered the fire pump package to Purfleet fully-assembled, in its own enclosure and requiring only final connections. The packaged sprinkler pump room is 5,000 x 4,000 x 3,200 mm in dimension. At the heart of the system is an Armstrong 8 x 6 x 12.5 MF, Factory Mutual approved diesel fire pump with 8” suction and 6” discharge ASA125 Connections. It is driven by a heat exchanger cooled diesel engine rated at 157 kW at 2,600 RPM. These are mounted on a fabricated steel baseframe, with a Tornatech FM Approved Controller, two sets of 12 v lead acid batteries and an 800 litre double skinned fuel tank. The package also incorporates an Armstrong Model AM2/12 Vertical Multistage electric jockey pump, driven by a 1.5 kW, 2,900 RPM, IP55 TEFV electric motor. The jockey pump has a dedicated 1.5 kW Tornatech Model JP3 jockey starter with pump start panel. The enclosure is clad with 45 mm thick composite insulated building panels. The insulation core is Loss Prevention Council approved CFC free urethane foam giving a thermal transmittance value of 0.43 W/m²K and a single figure weighted sound reduction of Rw = 27dB. The internal liner is pre-coated embossed steel, 0.35 mm thick. Inner and outer facings have Class 1 surface spread of flame to BS476: Part 7: 1987, and are Class O, as defined by Building Regulations. 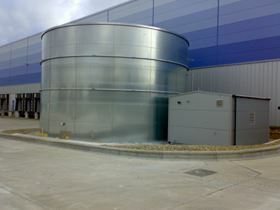 Manufacturing the pumphouse off-site enabled construction of the fire protection facilities to proceed concurrently with the rest of the building refit. On the date specified by the on-site project team, the pumphouse was delivered and final installation was achieved within days, instead of requiring a number of weeks. As compliance testing of the pumps could be carried out while the assembled pump package was in the factory, the time needed for commissioning was also reduced. This approach reduced the amount of contractor access necessary at the site, and helped to minimise traffic congestion in this busy part of Essex. In addition, health and safety risk was significantly reduced, as the plant room was built in the more easily controlled and regulated environment of a purpose-designed factory rather than on-site at the warehouse. Armstrong supplies an extensive range of fire protection equipment manufactured to international standards. The company carries certification from all relevant regulatory and advisory bodies in the UK, USA and Canada including EN12845 accredited pumps for European installations and models approved by the Factory Mutual Research Corporation, Underwriters Laboratories Inc, Underwriters Laboratories of Canada and Loss Prevention Certification Board.